Jennifer Walters has had a rough summer. She suffered near-fatal injuries and the death of her cousin, Bruce “The Hulk” Banner, in the pages of Marvel’s Civil War II crossover event, and that trauma is the foundation of Walters’ new ongoing series debuting in December from writer Mariko Tamaki and artist Nico Leon. 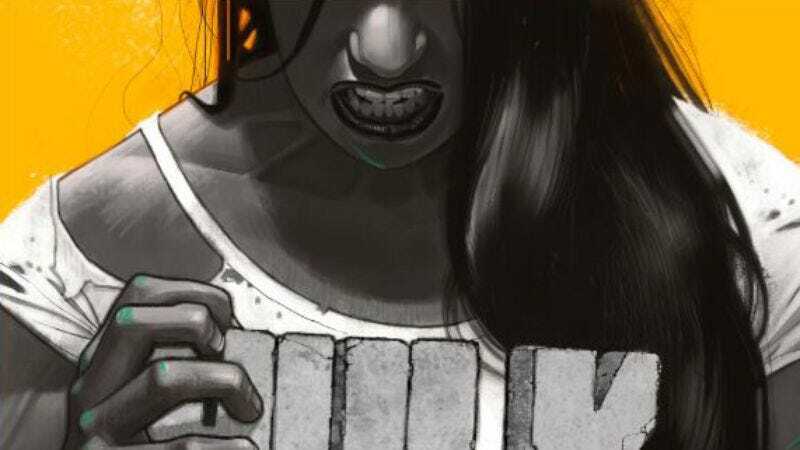 Hulk will explore how Walters’ turbulent emotional state impacts her efforts to resume her life as a lawyer and superhero, and ditching the She-Hulk marks a major shift for the character in the Marvel Universe. Mariko Tamaki’s work on books like Skim and the Eisner Award-winning This One Summer makes her an exceptional choice of writer to handle this new phase of the heroine’s life, and she has a talent for telling thoughtful, emotional stories about the human condition. She’s also shown that she can find compelling angles for licensed characters with her TMNT: Casey & April and Tomb Raider comics, and Tamaki makes a big move into superhero comics this December with both Hulk and her Supergirl: Being Super miniseries from DC Comics. Nico Leon has become one of Marvel’s most promising up-and-coming creators with his art on books like Ms. Marvel and Spider-Man, and Hulk is his first series debut at the publisher. “Nico Leon is an awesome artist,” says Tamaki. “I love the expressiveness, the speed and power, of his work.” That speed and power make Leon a great fit for superhero comics, but he’s most excited to handle Walters when she’s not in crime-fighting mode. “I think one of the most interesting and unique challenge in drawing her in this series will be to share with the readers her inside struggles,” says Leon. “All heroes have their own internal struggles, but in this series, Jen will be dealing with something new and huge that is happening inside her own mind. The great challenge will be to share that feeling with the readers. It is a serious topic and it needs our most careful approach.” This creative team’s track record suggests that Hulk will be handled with sensitivity and sophistication, and readers can join Jennifer Walters on her new path when Hulk #1 debuts in December.